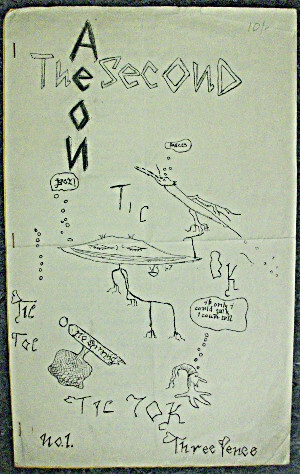 The Second Aeon was an avant-garde magazine which ran from 1966 until 1975, self-published by Welsh poet Peter Finch. Self-publishing suffers from a reputation as the last refuge of hack artists who cannot gain entry into the public sphere elsewhere. This may be true at times, but Finch developed The Second Aeon into an increasingly sophisticated medium. Poems of the abstract; Poems of the defined. Poems that are just sculptures from the mind................."